Sweethearts conversation hearts are the world’s most popular Valentine candies. Not only can you eat them and share them as fun candies, but you can also create some really unique crafts, homemade cards, and dessert recipes with them! How ever you choose to include Sweethearts conversation hearts in your Valentine’s Day activities, you’re guaranteed to make someone’s day. Most conversation hearts candies are sold during the 6-week period between January 1 and Valentine’s Day, making Sweethearts the #1 selling non-chocolate Valentine’s Day candy. See the archived lists of new candy hearts sayings from 2003 to 2009 and from 2010. Sweethearts are fat-free, sodium-free candies that contain 3 calories per small heart and 6 calories per large heart. For each heart-shaped candy, 5 letters fit on the top line and 4 letters fit on the bottom line. But if a W is used, then there are 4 letters on the top line and 3 letters on the bottom line. Necco will even custom imprint Sweethearts conversation hearts for you, if you’re willing to buy a full production run (approximately 3,500 lbs) of the 6-flavored candies (or 1.6 million individual hearts). Each year, JEOPARDY! includes a Sweethearts conversation hearts trivia question on its show in celebration of Valentine’s Day. Changes to Sweethearts candy flavors have not always been welcomed by the public. Check out this photo slideshow to see how Sweethearts candies are made! What (exactly) is inside a bag of Sweethearts conversation hearts? Did you know that you can order personalized M&M’s and other candies for Valentine’s Day? If you really want to make an impression… send some personalized “live” red roses to your loved one! 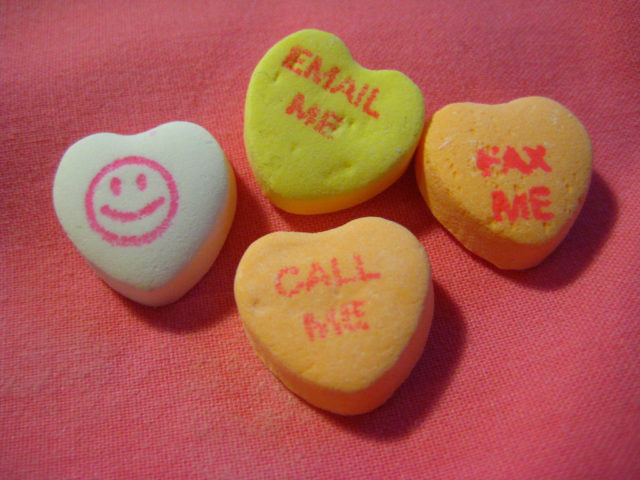 Or… make your own personalized candy hearts! Here’s how to make candy conversation hearts yourself — a tutorial. More fun stuff about Necco Conversation Hearts (aka Sweethearts candies). Here’s a fun Sweethearts candy card you can make and give as a Valentine card.